Montana's new governor, Brian Schweitzer, D, has wasted no time in leaping into the decades-old conflict over how to handle the world's last wild and free-ranging bison herd. In early January, Schweitzer cancelled the first proposed bison hunt in Montana since 1991, amid protests from some hunters that he had bowed to pressure from animal rights activists. Then on Jan. 17, he floated a plan to capture the estimated 4,200 bison inhabiting Yellowstone National Park, slaughter any animals infected with brucellosis, vaccinate the healthy ones, and then restock the park with the disease-free herd. The Montana Department of Livestock has been killing bison that leave the park since 1998, fearing they could spread the disease to cattle. 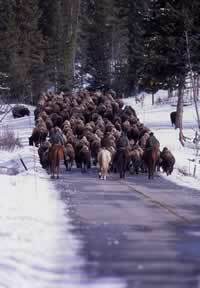 Schweitzer's plan includes paying ranchers to remove cattle from bison winter range on private and federal lands. He would also ask Wyoming to consider an alternative to the feeding grounds near the southern border of the Park, where unnaturally crowded conditions have resulted in a high rate of brucellosis infection in wild elk, which can spread the disease to both cattle and bison. "I'm the first cattleman to be governor of Montana in generations," Schweitzer told the Los Angeles Times. "I understand disease and cattle. I'll put the pieces together." Schweitzer's plan was greeted with a chorus of nay-saying. Biologists pointed out that testing and vaccination for brucellosis are far from failsafe, and expressed doubt that every bison in the park's 2.2 million acres could be captured. Cattlemen's associations objected to any suggestion of abandoning grazing lands. Environmentalist Stephany Seay of the Buffalo Field Campaign called the plan "draconian." And Wyoming Gov. Dave Freudenthal, a fellow Democrat, joked that Schweitzer "hadn't been in office long before he decided to help me run Wyoming." But as the uproar has subsided, most of the critics have begun to be cautiously supportive, if not of the plan to capture all the bison, at least of the governor's desire to find new solutions to the problem. Although there has never been a recorded instance of bison transmitting brucellosis to cattle, the threat is real, says Keith Aune, research chief for Montana's Fish, Wildlife and Parks Department. "Research shows pathways of transmission between bison, elk, cattle, even grizzly bears," he says. "We've gone to great lengths to keep bison from mixing with cattle, and that's why it has not happened yet." Experts believe that 40 percent to 50 percent of the Yellowstone bison have been exposed to or are infected with the disease, which is spread through contact with infected birth fluids and tissues. The infection rate in Montana's elk is far less, about 1 to 4 percent, because the state and private groups have painstakingly purchased winter range so that the animals are seldom found in dense concentrations. Wild elk on Wyoming's crowded feeding grounds, in contrast, show infection rates as high as 50 percent. Last winter, wildlife officials discovered that elk at a feeding ground in the Green River Basin had passed the disease to cattle. As a result, Wyoming lost its brucellosis-free status, an event that has so far cost ranchers about $1.8 million in new testing fees alone. The Montana Department of Livestock is vaccinating Yellowstone bison at three different capture facilities outside the park. But the vaccine's effectiveness is still uncertain, says department veterinarian Tom Linfield. Although livestock interests still object, there is increasing pressure to find more room outside Yellowstone for bison, whether the animals can be made brucellosis-free or not. "From the beginning, all of the bison plans have been hijacked by agriculture," says Dave Stalling, the president of the Montana Wildlife Federation, the state's largest hunting organization. "The bison are public wildlife, and they need to be allowed to roam like wildlife." Stalling says that the first steps should be to place wandering bison under the sole control of the Fish, Wildlife and Parks Department, rather than the Department of Livestock, and to start negotiating deals to remove cattle from some of the winter range on public lands. Buying out grazing leases might also provide enough country for a real, "fair-chase" bison hunt. Schweitzer cancelled the proposed hunt in January because the bison were concentrated in one area, and the hunt seemed certain to become like the bloody, close-quarters slaughters of 1989 and 1991 that brought an end to the activity. "I know that hunting bison will never be as challenging as hunting bull elk or whitetails, but we can create a respectable hunt," says Schweitzer, "and we can do it by sitting down with the few (livestock) producers down there and working out a series of conservation easements." The author writes from Montana.